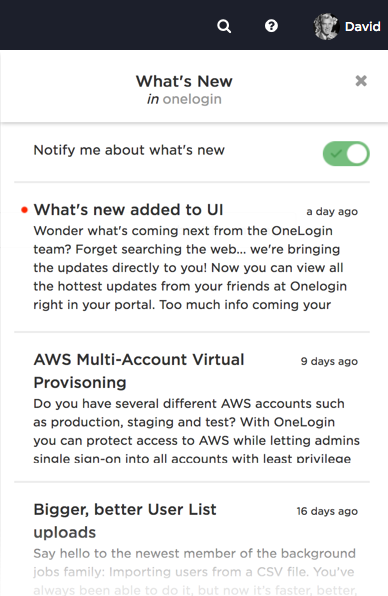 To stay up-to-date about new features in OneLogin, you can view short summaries of what's new from the profile menu in your OneLogin portal. Just expand your profile menu and click What's New. The What's New list opens up. 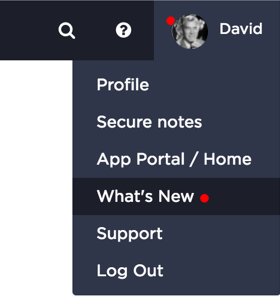 A red dot next to your profile picture or by the What's New link means that you have unviewed What's New items. The new items in the list are also decorated with a red dot. Click on any item to read more. To turn off the notification, click the Notify me about what's new toggle. This feature is available to OneLogin Account Owners and Super Users only.